With a growing subscriber base (currently 139 million) and its first-ever Academy Award nomination for best picture (Alfonso Cuarón's "Roma"), things have been going well for Netflix. 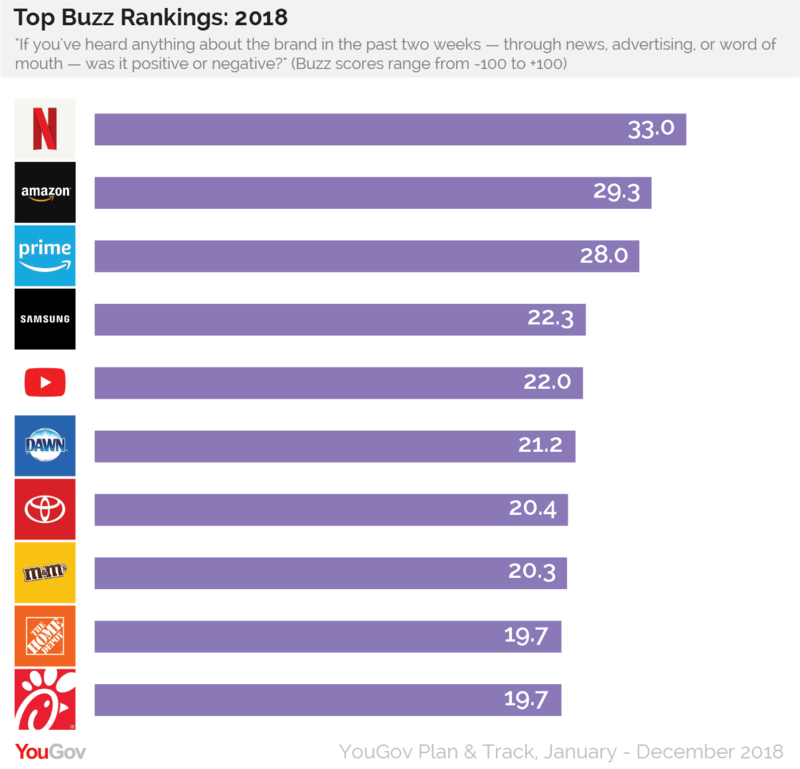 Now, more good news: The streaming service has claimed the top spot on YouGov’s annual Buzz rankings, outperforming nearly 2000 other brands across multiple sectors and industries. When asked if they’ve heard anything positive or negative about a particular brand in the past two weeks, US consumers gave Netflix an average score of 33 throughout 2018 on a scale ranging from -100 to +100. Amazon came in second place with an average Buzz score of 29.3, followed by Amazon Prime with 28. According to the online retailer, last year’s Prime Day was its biggest ever, resulting in shoppers buying more than 100 million products. Other brands with strong Buzz scores throughout 2018 were Samsung, YouTube, and Procter & Gamble’s dish soap Dawn. 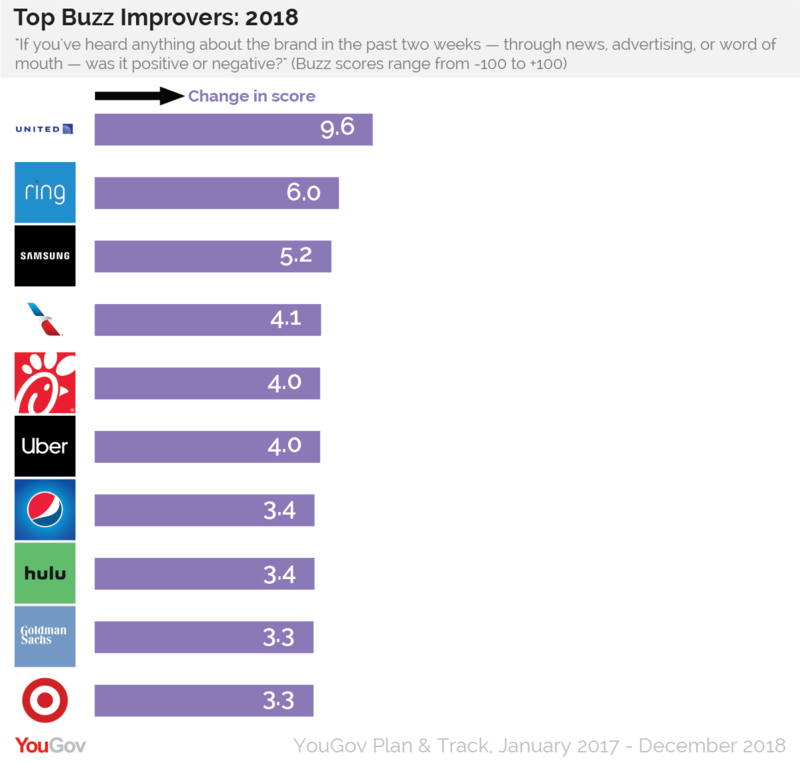 As for brands that received the biggest gains in Buzz score when comparing 2017 with 2018, United Airlines showed the largest boost in consumer perception. In 2017, when video footage of authorities forcibly dragging a passenger from a United flight emerged, the brand averaged a Buzz score of -13.1. This past year, however, the metric climbed 9.6 points to arrive at -3.5. Indeed, several brands on the top improvers list seem to be making comebacks from previous PR stumbles. Samsung (5.2-point gain), for example, has had to deal with exploding smartphones. Goldman Sachs (3.3-point gain), on the other hand, faced negative press during the 2016 presidential election. Younger brands, such as Ring (6-point gain) and Hulu (3.4-point gain), appear to be improving in Buzz as they grow in public awareness.